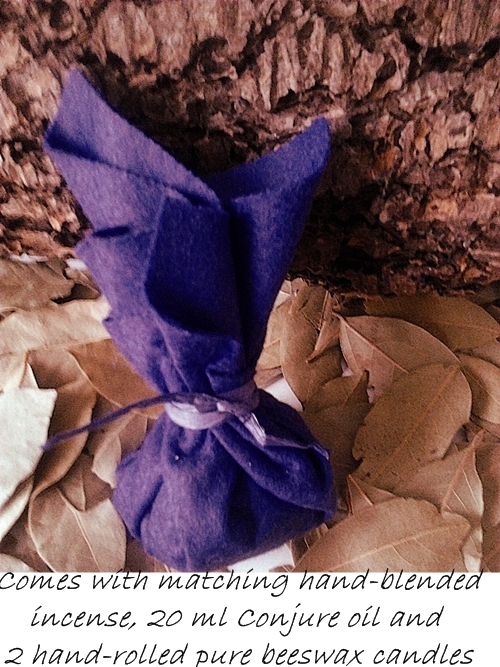 Home » The Enchanted Land » PSYCHIC VISION Mojo Bag Plus Matching Oil, Incense & Candles. PSYCHIC VISION Mojo Bag Plus Matching Oil, Incense & Candles. ABOUT ME My name is Victoria Zasikowski. Although reading the cards is my main job, I am also a practitioner of Hoodoo magick. I am what is known as a "rootworker" or what some might call a "conjure doctor". I worked on the "other" big auction site nearly 5 years, up until the September 2012 ban on psychics and spellcasters. I gained over 4,000 feedback during my time there and you can check out here : http://feedback.ebay.co.uk/ws/eBayISAPI.dll?ViewFeedback2 userid=picklepuddingpie ftab=AllFeedback To read all about mojos and check out FAQ's, scroll down this listing. I am in the UK but The Mojos I make can be sent anywhere in the world and are sent out ready-assembled for you. I do not tie it permanently though - you will be able to undo it and add some of your hair and nail samples, and other personal concerns. Full instructions will be sent out to you about this. PSYCHIC VISION MOJO BAG Psychic Vision Mojo Bag : Enhance your spiritual insight ,psychic awareness and induce prophetic dreams. Recommended for beginners on the pychic development path. For those of you a bit more practiced, check out my "Fortune Teller's" Mojo bag, designed for psychics and clairvoyants with some experience already behind them. Complimentary Hoodoo products available in this formula include : Conjure oil (for when you run out), sprinkling powder, hand-blended incense, magickal bath mix, hand-dressed candles, jack balls, spellvelopes plus deluxe spell kits .I also offer spellcasting service, which can boost any mojo bag work you do. See my shop for these. WHAT IS INCLUDED WITH YOUR MOJO BAG Each mojo bag comes with the following : (1) A generous 20 ml corked glass bottle of annointing oil that is made to match/compliment your chosen mojo. This is sealed with special sealing wax to prevent leakage during transit and is attractively labelled on the front. (2) A vial of hand-blended incense in the same formula- this will be used to "smoke" your mojo and for creating a magickal atmosphere when working with it . I will also include a few of the charcoal discs you need to burn it on . 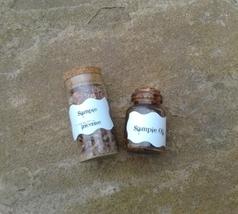 The incense will also be in a lovely glass bottle with a corked top. (3) Parchment paper for you to write your petition (request/intent) on (4) 2 small hand-rolled beeswax candles , colour coordinated with your mojo bag for continuity of colour magick (5) Full instructions All items are carefully packaged and nothing on the packaging reveals what is inside. If you are outside of the UK, I have to fill out a customs label which is adhered to the front. I will usually write, " Candles" on this form. OTHER MOJO BAGS AVAILABLE Please check my other Mojo bag listings for other issues /life areas I do Mojo bags for. All Mojo bags I make up contain many genuine herbs and roots specific to Hoodoo practice alone. These often have to be bought in from abroad - you are getting the REAL DEAL here . Please be mindful that a huge majority of so called "Mojo bags" on the net use only cheap kitchen herbs, non-authentic pouches and do not come with special oil like mine do. They may be cheap, but they won't pack the power that my Mojo bags do. You will note that some Mojo bags cross into territory that is not all that "benign". I myself do not practice this kind of Hoodoo but am happy to cater to those people that do. If you are confused about which Mojo to go for, or have any questions that are not answered within this listing, then please email me. Also, if a Mojo Bag for your situation is not in my listings, please enquire, as I can make one up for just about any situation. WHAT DO YOU NEED FROM ME ? Nothing besides your email address, name and your full postal address, if this is different to the one on your Paypal receipt. WHEN WILL I GET MY MOJO BAG ? I am pretty quick to get these sent out. If you are in the UK /EIRE it will usually be sent out within a few days of your order, via 1st class mail. If overseas, again, I post out within a few days by Airmail and this usually takes between 5 and 7 days then to reach you. EVERYTHING YOU NEED TO KNOW ABOUT MOJOS HOODOO MAGICK What is Hoodoo Magick ? Also known as "Conjure", or "Rootwork" Hoodoo is a form of traditional folk magick that developed from the melding of various systems of magickal concepts and practice from a number of separate cultures and magickal traditions. Hoodoo incorporates practices from African and Native Americal tradtions and has also been influenced by European magickal schools of thought. Hoodoo is a magickal system that is not really that commonly practiced in Europe though as yet, but it is very popular in the U.S.A, especially in the area called the "Deep South". If you haven't heard of Hoodoo, you have probably heard of Voodoo, but Hoodoo should not be confused with "Voodoo", as that is a different system of magickal practice, although is does share some similarities . Hoodoo is a non-religious form of magick which does not require a belief in any particular religion or any deities. That said, a large majority of Hoodoo practitioners are Christians, a trend that is undoubtedly linked to the fact that most practitioners of Hoodoo are Afro-Americans , born into a culture with strong Christian roots and influence. There are of course a sprinkling of practitioners who, like myself, are Caucasian and as non-religious as they come ! Unlike other magickal systems, Hoodoo does not require the practitioner to work at "special" times of the day or month ; there is no requirement to perform spells on a New or Full Moon for example. Incantations to deities of any kind , or spirits, are not necessary either, and no particular kind of ceremonies need to be peformed. The use of herbs, roots and other "curios" , together with knowledge of the magickal properties these contain, are all that the non-religious Hoodoo practitioner relies upon, although there are of course many practitioners who will incorporate petitions to deities and saints in their magickal work . In Hoodoo, it is believed that the roots and herbs are magickal in and of themselves , each with their own set of potential applications to effect the changes in ones life that are being sought after. Herbs , resins and roots used in Hoodoo do not require any "activating", such as being prayed over or meditated upon, as they are seen as already being "alive" and filled with magickal potential. Many of the roots and herbs used in Hoodoo are not easily obtained within the UK or Europe, so for a practitioner like myself, have to be ordered in from America on specialist sites. A Hoodoo practitioner is not known as a "witch", but is usually referred to as a "Conjure Doctor" or "Rootworker". Practitioners of Hoodoo offer a full range of spell casting services, just like a Magickal practitioner from any tradtion does. Spells and products for just about every life issue you can think of are available, but perhaps where Hoodoo differs from European services, there is usually a good range of products available to use for less "benign" purposes. Products to curse, control, take revenge and influence others are commonly available on Hoodoo websites . Hoodoo products are many and varied, with a good portion of goods for sale being totally unique to Hoodoo and not to be found in other tradtions. The typical range of Hoodoo products and their applications can be read about in another article on this site. This is really only the briefest overview of what Hoodoo is. If you would like to know a bit more, then just google , "What is Hoodoo", and a large number of search results will be returned for you to browse through. What is a Mojo Bag ? 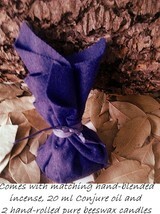 A Mojo bag is a common staple of Hoodoo magickal practice. Also known as a Mojo hand, Conjure bag, Trick bag, Root bag or Gris-gris, a Mojo bag is a small, portable sealed pouch which has been filled with specialized herbs, roots and other curios which are appropriate to the magickal purpose of the bag. Traditionally, Mojo bags are made up using red flannel cloth, though the use of other materials and colours is not unusual. I myself use felt, and choose a colour appropriate to the spell. I fill the square of material with the necessary contents, gather all edges up and tie it off . Please beware of "Mojo Bags" made from sheer fabrics - you should NOT be able to see into a Mojo Bag. Bags made with those organza pouches are NOT authentic Hoodoo Mojo bags. Mojo bags are fairly small - approximately 2-3 inches wide and 2-3 inches tall, with a few of inches of additional height from the gathered material which has been tied off. What's inside a Mojo Bag ? The Mojo bags I offer are not a "one size fits all" . Each bag is tailor made for YOU and you alone, so no two bags have the exact same contents. I will decide what goes in there after you give me a brief outline of what you seek to manifest. I follow old, traditional Hoodoo recipes. A typical bag will contain various herbs, specialist roots (often only available through ordering in from outside the UK), and a curio or two. A "curio" is an umbrella term for a range of items used in Hoodoo which do not really fall under the "herb" or "root" category. Examples of some common curios include lodestones, magnetic sand, sulfur, iron filings, black cat hair, graveyard dirt, tonka beans, shells, seeds. These name but a few ! Sometimes a Mojo bag will also contain a piece of gum resin, if the case requires it, or perhaps some spices. How can I tell if a Mojo Bag is Good Quality ? You are probably aware that on other sites, the majority of Mojo /Spell bags that are sold never ask for you /advise you to place personal concerns in them and many do not come with an accompanying annointing oil.These are NOT authentic bags and will NOT be anywhere near as powerful as ones that DO contain personal concerns from yourself and any one else involved and that DO have the specialist oil with them. Also beware of ultra cheap Mojo Bags in see through organza pouches - authentic Hoodoo roots and herbs are often only available from America and as someone who buys and uses these imported ingredients, I know for a fact that the contents of a GENUINE Hoodoo Mojo Bag cost WAY more than what those cheap ones sell for, so they cannot contain much of anything specialist . My bags are not filled with "junk", they contain very powerful, authentic, Hoodoo herbs , roots and curios , put together for you on an individual basis. Beware cheap imitations and anything in see through pouches ! What do you do with a Mojo Bag ? The Mojo bag can be thought of as a portable altar which reminds you of what you intend to manifest in your life. You should keep your Mojo bag with you as much of the time as possible; when you sleep at night, place it under your pillow or within your pillowcase sleeve. If you are staying at home in the day, place it in a pocket, or lodge it in your bra . If out and about, again, use a pocket if possible, otherwise place it in your handbag . By keeping your Mojo bag close like this, you constantly remind yourself of what you are asking the universe for, and you amplify your intentions on a consistent basis. You must work with your Mojo bag to help bring the results that you want. Once a week, you will need to "feed" your bag with the oil it came with. You do this by dabbing it with the special oil that comes with your bag. Just dot the oil in 4 or 5 places using your finger. Try to do this on the same day each week. If you are working more than one bag, work with each bag on a different day.It is also good to take it out (when you are alone) and sit quietly with it, just "feeling it" and even talking to it . It is quite common to give each of your Mojo Bags a name. It doesn't matter what the name is , and if something unusual comes to mind, that is just fine. The bag's name might come to you straight away, or it might take some weeks of working with it before something comes to mind There are a some of exceptions to the rule of keeping it on your person though : - if your Mojo Bag is for "safe travel" for example, then you would keep it in your car at all times, not on your person , but again, keep it out of sight - underneath a seat is a good idea. If your Mojo Bag is for a home blessing, then you would place it somewhere safe and out of sight within your home. In such cases, you should still take it out once a week and feed it with it's special oil and say a few words to it. Instructions will be emailed on a case-by-case basis for these kinds of intentions . If in doubt, just ask ! What if someone sees my Mojo Bag or touches it ? It is VERY important that you do not show your Mojo bag to anyone ! In Hoodoo tradition the life force of your Mojo Bag is destroyed if anyone else's eyes fall upon it, or it is touched by someone else. Obviously the person who made it for you does not count, but please be careful not to leave it on view anywhere, or to take it out when someone else is in the room with you. The only exception to this rule would be if the eyes of an innocent child fell upon it or their hands touched it. If you share a bed with someone, it is probably best to sleep with your Mojo bag inside your pillow case, rather than to place it underneath. Tuck your pillow case "flaps" in and ensure it is on the underside of the pillow, within the case, to avoid you feeling the lump when you sleep. Can I open my Mojo Bag ? Once you have added your items to it and permanently sealed it, then NO. If the bag is opened, the spell is broken. My Mojo Bag got wet. Is it ok ? If a little water tips on it, don't panic, but if it gets soaked somehow, then the bag will no longer work so you would need to get a replacement. How many Mojo Bags can I have at one time ? There is no hard and fast rule about this and common sense would suggest much depends on what the bags are being used for. Some bags don't need to be worn on the person/slept with , so a person might have 1 bag for safe travel, kept in her car, then a 2nd bag for home protection, placed in a cupboard somewhere, then two that she is working on a more hands-on basis.She might be after a certain guy she has her eye on, which would mean sleeping with and carrying a mojo around, but then she might also be seeking a new job. I'd say the maximum I'd personally want to carry on my person and sleep with is 3. In the case of the imaginary person here , 4 is fine as 2 of them are not required to be with her most of the time. Do remember that life issues can benefit from other Hoodoo products anyway - a spell kit or honey jar spell for example (coming soon), so you could be working two mojos, do 3 spell kits, and have two honey jars on the go ! How long does a Mojo Bag last ? It doesn't have an expiry date really, it can go for years. Most desires manifest way before that time, but it's useful to know it has no expiry date if , for example, you were buying one for a long-term intent, such as home protection. If your bag does feel lifeless after an appreciable time, you will feel this, and can order a new one or have it "refreshed" -you send it to me and I replace certain dried items in it for you for a small handling fee. How long for results from my Mojo Bag ? Do remember that in order to manifest your desires, you MUST work WITH your mojo bag , and not just forget about it. Your faith and belief in your bag will fuel the magickal process , as will giving it attention. If you are doing all that has been advised throughout this page, and your desires are not ridiculously unrealistic, then your Mojo bag WILL work . You can anticipate results in a matter of weeks in some cases, or several months in other cases. I don't think my Mojo bag is working. PLEASE do not come punishing me with bad feedback if nothing has changed after 3/4 months. Either you were not working with it correctly, the bag is dead after being seen or touched by someone else, or your desire was hopelessly unrealistic to begin with ;) For example, seeking a lottery win is worth a shot but it's a LONG shot, mojo bag or no mojo bag. Asking for your ex to return though he's been gone from your life for 2 years is also unrealistic. Seeking to lose 2 stone in 2 months while stuffing your face with junk food will not work and nor will mojo bags help you fly/change your eye colour/grow hair faster , etc ;) There are also times when a case is complex or stubborn and would benefit from using additional products that further empower the manifestation process. Do I need anything else apart from a Mojo Bag to manifest my desire ? It is quite common for people to work a Mojo Bag, use a spell kit, employ special powders , incense and bath soaks, all for the one situation they are working on. It's really an individual decision but there will be times when some cases need extra power or a person just "feels the need" to go deeper into the magickal work they are seeking help from. Hoodoo powders are made from ground down roots, herbs and/or spices which are chosen on a case by case basis to work in tandem with what you desire to manifest with your mojo bag. Powders can be lightly sprinkled in any room/s in your home, dusted on your person, secretly dusted on the object of your spell or sprinkled in their pocket or shoes…they can be sprinkled outside your dwelling place or in your car. There are many possibilities and I can advised you what might be best if you want me to. Bath mixes are always a good addition to spell work . They are most commonly used in a weekly ritual bath (or washdown in the shower) as a way to get you in the right frame of mood prior to working with your mojo bag or doing other spell work. Again, the ingredients will vary according to what spell you are working on . What do I do with my Mojo bag once it's finished its work ? Burial is the usual way. Preferably on your property but if not, take it to a forest or someplace similar and bury it there. Dig a hole around 6 inches deep and put it in there without opening it. Do you do refunds ? Not for these products, no. If your item has arrived damaged in some way, then please contact me to discuss as I will need to make a claim with the delivery service.